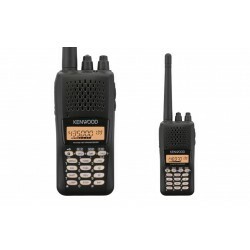 A powerful communications tool in every sense, KENWOOD’s new TH-K20A/K40A radio offers 5.5 watts of RF output to ensure reliable performance frekuency VHF 136-174MHz. The TH-K20A/K40A has 200 memory channels – with a 6-digit Memory Name function to enable clear identification – plus 6 program scan memories, 1 call channel and 1 priority channel. Another feature that sets the TH-K20A/K40A apart is sound: it benefits from the audio expertise for which KENWOOD is renowned. High sound pressure – which is not the same as volume – delivers a clarity that is unmistakable. Just listen once and you will appreciate what a difference it makes. Thanks to the built-in CTCSS (Continuous Tone Coded Squelch System) and DCS (Digital Code Squelch) encoder/ decoder, the TH-K20A/K40A can handle 42 CTCSS sub-tone frequencies plus 104 DCS codes. And one can set separate TX and RX signalling types so as to access a repeater that uses different encode/decode signalling.